You might have noticed the lack of beauty reviews on my blog lately, I sure have! I think the thing I hate most about not working is not being able to buy make up - I'm having some serious withdrawals! And of course because I can't buy any new products, I can't write any reviews. So I thought that I would make a list of all the products I'm pining for, and that I would review if I could! Colourpop Lippie Stix - Since the news about Lime Crime being shady as hell came to light (read more here) I've been looking for other lipstick companies to give my business to, and Colourpop looks amazing. They have a massive assortment of colours, including the more far out shades of mint green and lilac, and the best part is they're all only $5! I've read a lot of reviews, and the formula looks much smoother and more even than Lime Crime's, some of which I've found to be quite patchy and flakey. Each colour has a matching pencil liner available too. The shades pictured here are Rocket, Cookie, Fetch, Go Fish, and Bossy. Makeup Revolution Blushing Hearts - These are pretty obviously a dupe for Too Faced's Sweethearts blushes, and I'm not mad about it because I absolutely love my Sweetheart but at $39 it's very much an indulgence product for me. 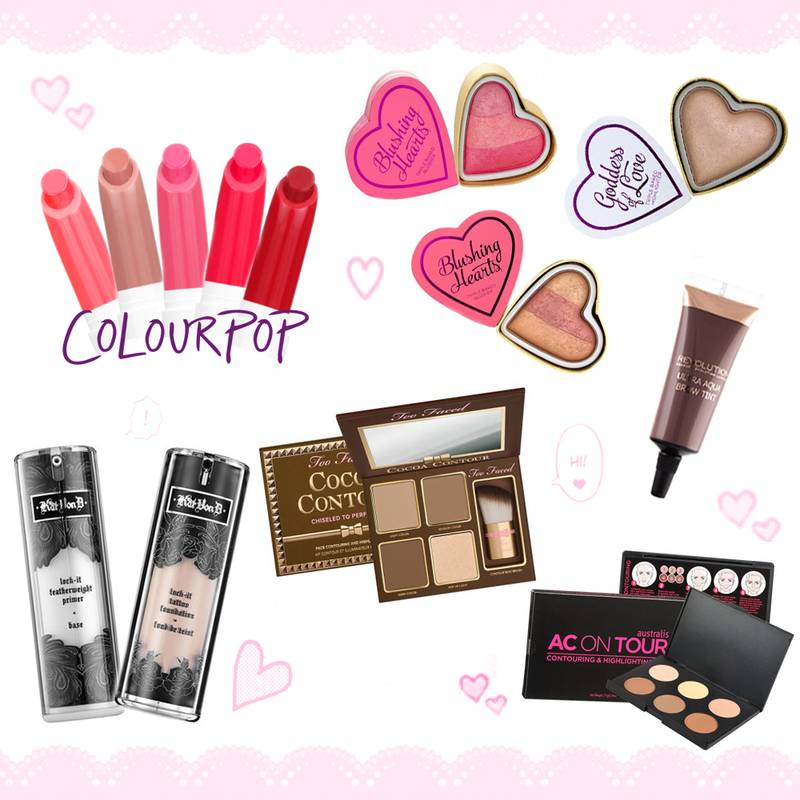 Enter the Blushing Hearts range - they're only $9.90 each, they come in so many shades, and there are also baked highlighters and bronzers available. The shades pictured here are Blushing Hearts, Goddess of Love, and Peachy Keen. Makeup Revolution Ultra Aqua Brow - I am no different from any other lady in her twenties in that I am obsessed with my eyebrows being perfect. I've been using eyeshadow to fill in my brows for nearly three years now, but I'm intrigued by liquid brow products. I love eyebrows that look almost painted on, so I'm very keen to try Ultra Aqua Brow at some point. It's only $5.95 compared to the $16.20 of Anastasia DipBrow that everyones losing their minds over at the moment, so even if it doesn't work out it wouldn't be a huge loss! Australis AC On Tour Contour Kit - It seems to me that contour kits are the must have product of 2015 so far, and this Australis one has sold out across the country! I've read a lot of great reviews and swatched the product in store myself, and I'm so keen to try it. I'm such a contouring novice that I need all the help I can get, and for $16.95 I think it's a fairly reasonably priced lesson. Too Faced Cocoa Contouring Kit - This contour kit doesn't seem to be available in Australia yet, and I'm sure once it is it'll retail for around the $68 mark (it's $40 US on the Sephora website, but as we Australians know we're subject to some of the most ridiculous markups on cosmetics). I have the Chocolate Soleil bronzer from Too Faced and I LOVE it, so I assume this kit would be similar - silky smooth and chocolate scented. Hopefully it will be on our shores later in the year and Santa will be super nice to me! Kat Von D Lock-It Primer & Tattoo Foundation - Sephora still don't have an Australian website but after some Googling I found that the Tattoo Foundation retails for $49 (In the states it's $34, so much for price matching Sephora ya jerks! ), though I wasn't able to find the price for the primer. I used a squirt of this foundation from my friend Zoe's bottle while I was in Melbourne last year and I loved it - I mixed it with a pump of Revlon ColourStay and it made my makeup last so much longer than usual, and it gave a really even coverage. I'm a Kat fan from her days on Miami Ink and I would watch it religiously when I was 14, and I really love the look of her line so hopefully Sephora will open a store in Adelaide at some point and I can snoop around her products close up! Is there anything you think I've missed? What beauty products are you hankering after at the moment? Let me know in the comments!